Summary of today’s show: How does a stint in the Marines help with the life of a parish priest? Fr. 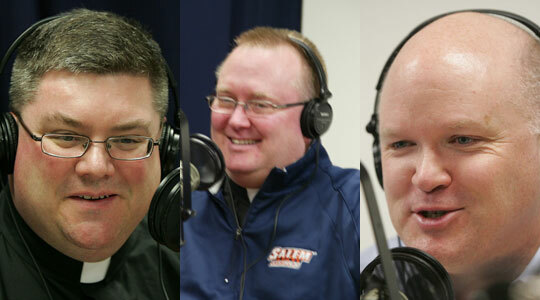 Edward Doughty sits down with Scot Landry and Fr. Chris O’Connor to talk about his childhood in Woburn, which is the hotbed of priestly vocations in the Archdiocese of Boston; serving in the US Marine Corps’ drum and bugle corps; being ordained in one of the biggest ordination classes in the US in the past 20 years (18 men in 1995! ); serving in parishes in Danvers, Manomet, Weymouth, and Randolph; working campus ministry at two state colleges; and returning to parish ministry as pastor of St. Francis of Assisi Parish in Medford. Be prepared for some laughs and listen for the plug for Fr. Robert Reed of CatholicTV. 1st segment: Scot welcomed Fr. Chris to the show and they talked about Fr. Chris spent his Easter with his family and helping at a couple of parishes. He said the crowds seemed larger this year. Fr. Chris talked about how great it is to celebrate Easter for the eight days of the octave. Fr. Chris also talked about going to a Catholic school to be the mystery reader for the second grade. 2nd segment: Scot and Fr. Chris welcome Fr. Ed Doughty to the show. Fr. Ed talked about growing up in Woburn at St. Barbara parish. He attended all public schools throughout his schooling. They discussed other priests who came from St. Barbara’s, including Bishop Chris Coyne of Indianapolis. Fr. Ed graduated from Umass Lowell with a degree in music education, but wasn’t able to get a job as a music teacher. He went to the recruiting office to join the Navy, but the Navy recruiter had reached his goal for the month and wasn’t speaking to anyone. As he walked down the hall, the Marine recruiter stopped him in the hall to talk and before he knew it he was on a plane to boot camp at Parris Island. Scot said it seems that Marine boot camp is very scary as a form of physical exertion. Fr. Ed said you arrive in the dead of night off a bus and then the 13 weeks go by in the blink of an eye. You arrive thinking you’re not going to be able to do anything and leave thinking you can doing anything. Scot asked how his Marine formation helps him today as a priest. Fr. Ed said sometimes it’s a positive and sometimes a negative. He said Marines can have a swagger that makes you less passive than people expect from a priest. Sometimes he’s a little less likely to take direct complaints passively. On the other hand, he’s more disciplined, less likely to be late. Fr. Chris said Fr. Ed was in the drums and bugle corps. Fr. Ed said they traveled around the country most of the time to Marine and Navy installations, but they also performed for President Reagan. Fr. Ed said every Marine is a rifleman so they kept up their training in that area, but their primary job was to be a musician. Fr. Ed said he grew to appreciate his time in the Marines after he got out. When he was in the Marines, it was a bit of a grind being on the road all the time. He has maintained some great relationships from that time. He looks back only with fondness. Fr. Ed said his first hint of vocation came when he was 12 years old. Fr. Rodney Kopp was in his deacon assignment at St. Barbara’s at the time and was a role model. During his time in the Marines, he got away from the regular practice of his faith, but when he came home he became friends some newly ordained priests and they encouraged his vocation. Once he went on a retreat at the seminary, he felt like he belonged where before he thought he was just doing it to get his friends off his back. His attitude the whole time at the seminary was, “If they keep me, I’ll stay.” Before he knew it he was walking down the aisle for his ordination. Fr. Ed said he always prayed that he would end up where God wanted him to be. He said he also grew up in a family that had a great devotion to the Eucharist, which helped a lot. Scot said that it’s important to recognize that discernment of the priesthood is mutual between the seminarian and the seminary. Fr. Ed said he was 30 when he entered the seminary and there were men both older and younger than him, as well some guys he’d gone to high school with. Fr. Chris said in both the Marine Corps and the seminary you need a rule of life. Fr. Ed said Marines have a plan of the day posted each day that told you where you had to be each day. The seminary was similar with schedules for the liturgical and the academic. Fr. Ed said he’s a pretty scheduled person anyway. At the time of his ordination, his dad had been very sick and his biggest memory from that day was that his dad was unable to go, but his dad watched from home. At one point the Cardinal asked parents and godparents to stand up to be recognized and his sister said his dad stood up at home. His dad was able to attend his first Mass, but was hospitalized the next day and it was his dad’s last Mass. Fr. Ed said it’s the greatest blessing for him that his dad was the first to receive communion from him at the Mass. Fr. Ed said he preached his first Mass. He was going to have someone else do it. One of his childhood friends is Dr. Kevin Mooney, who told him that no one was going to the Mass to hear someone else preach so he did it himself. In the end, his dad got to hear him preach. Fr. Ed celebrated his father’s funeral Mass, but Msgr. John McLaughlin preached at the Mass. Fr. Ed said he teased Msgr. McLaughlin relentlessly when he was given the honor recently. He’s currently campus minister at Boston University and was previously the first vocation director for the Archdiocese of the Military Services. 3rd segment: Fr. Ed was ordained in 1995 in a class of 18 men. His first assignment was at St. Richard in Danvers, then St. Bonaventure in Manomet. He didn’t know where Manomet was. Fr. Ed said it was a fantastic parish with a lot of young families and an enormous religious ed program. Plus it was living at the beach. Fr. Ed said it was a booming parish then and it’s gotten larger. They’re building a new church in the parish. Fr. Ed was involved in youth ministry, that started with about 9 kids. He said they went to a completely prayer-based youth ministry program. Everything was based around some kind of prayer experience. It started to attract kids. They also did a targeted recruiting, calling 250 kids from someone in the program and sending invitations to those who responded positively. The first event had 125 kids and they gained momentum until there were 200 or 300 coming on a regular basis by the time he left. His success came from hounding the kids, being relentless in inviting them back to events. Fr. Ed said young people get it much more than we give them credit for a lot. One of his pet peeves for youth ministry is when parishes have an event and invite the kids only to be workers. But how often do we invite kids to be part of the group? Fr. Ed also made sure the people who invited made the kids feel like they were wanted at the event so badly that it would hurt badly if they didn’t go. After Manomet, he was sent to St. Jerome in Weymouth for a year before being sent to St. Bernadette in Randolph as pastor. Scot said he got to know Fr. Ed because of his implementing the Catholic Appeal as well as any pastor. Fr .Ed said there were 23 language groups in the parish, including Vietnamese, Nigerian, Filipino, and Haitian. Fr. Chris asked how they brought them together, but Fr. Ed said he’s not sure they ever got to where they wanted to be. Mostly he wanted them to have their own identity and accommodate them to be who they are. Fr. Ed said he particularly recalls Vietnamese New Year celebrations as an enormous celebration with food and joy. Fr. Ed said during his time in the parish, they torn down and built a new building that has become the daily Mass chapel. After St. Bernadette he became campus minister at Salem State and U Mass Boston. Fr. Ed said life doesn’t begin until noon on the campuses. He said it was interesting for him to talk about faith on a publicly funded college campus. People would tell him that he has to be a little less Catholic, but he’d reply that he’s Catholic and that’s what he’s going to say. He said the people he met were very friendly and mostly he was expected to show up at games and events and dining facilities. Fr. Chris said it sounds like the ministry of presence. Fr. Ed said UMass has an interfaith chapel where he’d say daily Mass a couple times per week. At Salem State he didn’t have an office or chapel so he’d just wander around the campus most of the time. He’d just try to make eye contact with students, faculty, or staff and say hello and try to have a conversation. Sometimes those brief encounters would lead to more. Fr. Ed said he would celebrate Sunday Mass at Salem State in a conference room on the campus. Scot asked how serving as a campus minister differed from serving in a parish. Fr. Ed said in seminary they warn you about being a lone ranger in the diocese where you operate by yourself. But on campus, you really are alone. You have to be willing to put yourself out there and hope that in your prayer you’re bringing an atmosphere of faith with you. Fr. Ed said a great day was if a kid honked your horn at you as you walked down the street. It was really the small victories. Once he was in a dean’s office and a staff member told him how she was hearing nice things about him and how he was making great connections with students. Later he told the dean he couldn’t remember remember the last time anyone spoke to him, but the dean said everyone notices him and see him in the same places all the time. His presence matters to kids wherever he is on campus. Fr. Ed said you can’t go in expecting students to fit in a particular mold. You have to take them where they’re at. Many of them come from families that don’t practice faith and the minister may be the first person they’ve spoken to in a faith context. 4th segment: Fr. Ed became pastor of St. Francis of Assisi in Medford on March 1. Scot noted that every single post on Facebook from Fr. Ed prior to March 1 was a joke so at first he thought the announcement was a joke. Scot asked Fr. Ed what a new pastor does when he comes to the parish. Fr. Ed said he starts with a prayer he doesn’t destroy the place. He said it’s almost a sensory overload, where you meet all new people, have an all-new schedule, and there’s all kinds of people you need to talk to and learn about all while trying to learn where the parish is, what needs to be done, and who’s involved in the parish ministries. He had to quickly learn who’s on the parish council even as he’s involved in pastoral planning activities. But there is a great rhythm in the parish. He starts the day with celebrating Mass and then go about with whatever is necessary, whether a funeral or a meeting or some administrative duties. Fr. Ed said everyone who’s been dissatisfied with something come to see the new pastor first. You try to respectfully give them time and you may or may not agree with what they want. He said he often doesn’t even know what they’re talking about. But he’s willing to listen to people who’ve lived there a long time because they can help him get a read on what they want to happen. He’s learned not to take things personally and that he doesn’t have to be in a hurry all the time. Fr. Chris said the wise advice is that the only thing the new pastor needs to change in the first year is change his socks. The new pastor is learning to lead and shepherd this particular community. Fr. Ed said it’s important for people to know that he asked to be sent to st. Francis when the opening became available. Fr. Ed said St. Francis is a middle class parish of hard-working people raising their families who love their parish. It’s a beautiful church with facilities that have the potential to do so much good for the community. They had temporary administrators for almost a year before he came which led to uncertainty. Now they can relax knowing that Fr. Ed is assigned there for six years. Scot said you can see the church from Route 93 and asked how many people come to daily Mass are just commuters on their way to work, but Fr. Ed said the Mass is at 9am so they don’t get a lot of them. Fr. Ed said his parents’ devotion to the Eucharist has led to him knowing that the high point of his day is celebrating Mass with his parishioners. Then being nourished by that, it allows him to go through the rest of the day with a sense of peace and purpose and urgency, not in the sen of having to change anything, but wanting to get at the daily routine. He said his favorite saints include St. John Vianney, even before knowing he was patron saint of parish priests because he was thought to be somewhat lacking in academics. HE shows a regular guy can have an effect and make a difference for people. Also St. Francis and St. Bonaventure have been particularly important to him as well. He loves that everything around the parish reminds him of St. Francis. Being back in a parish for Easter was great. Fr. Ed also gave a shout out to Fr. Bob Reed of CatholicTV.